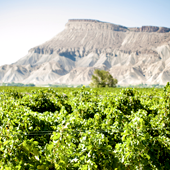 Join us at our farm winery overlooking our vineyard and the spectacular vista of the Grand Valley. Enjoy a free, educational wine tasting, peruse the fun wine items in our gift shop, picnic on our terrace and enjoy the view. Our award-winning wines include: Chardonnay, Viognier, Cabernet Sauvignon, Cabernet Franc, Shiraz, Merlot, Rosé, Gewürztraminer, Riesling, Sweetheart Red, Moscato, Zero Below, Riesling Icewine, and Ruby Classico. 100% Colorado Grown.